Bill Murray meets the groundhog. When I first saw CaddyShack I thought Bill Murray was a little off fighting that gopher because up until about three years ago we never had a gopher or a mole in our yard. That was then, this is now. MOLES! We do not have gophers in New York, we have moles. Everyday garden variety moles, garden moles. 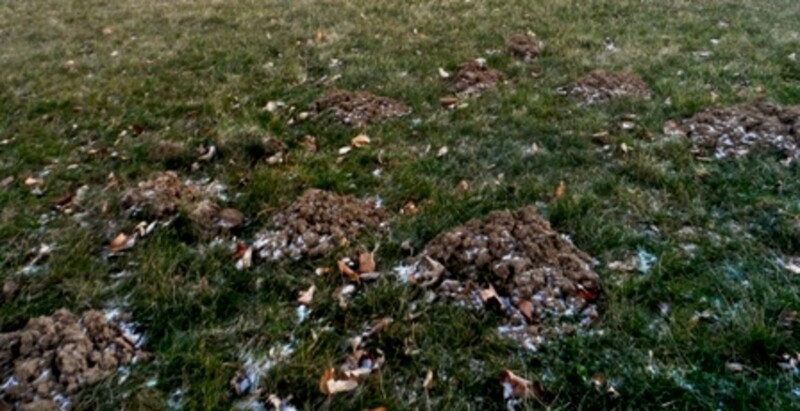 The term 'garden moles' does not mean they eat your garden, they eat insects, bugs, and worms. 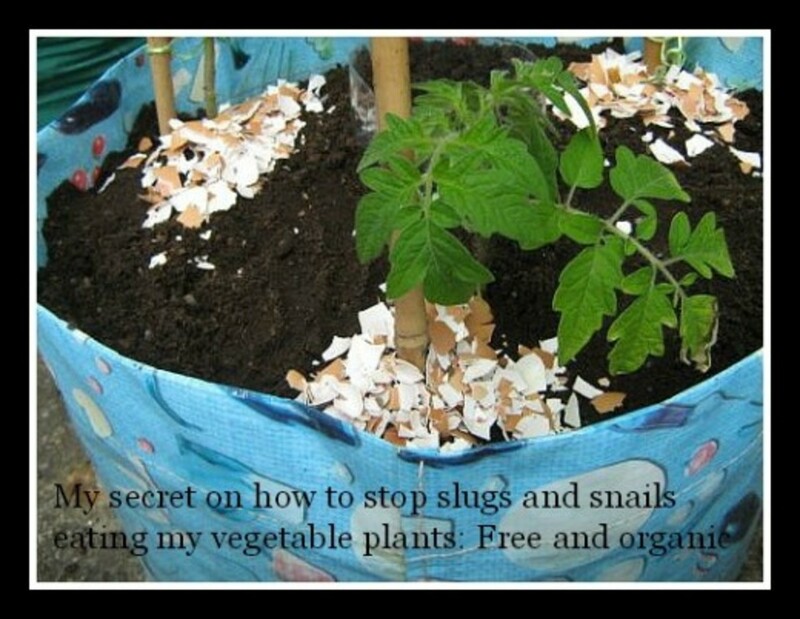 However, in the process of getting to their food they tunnel all over your garden and the tunnels sometimes loosen your plants and their roots and the end result is dead flowers...from garden moles. I'm thinking of calling Bill Murray to see if he has any ideas on getting rid of these garden moles. All the work you put into preparing your soil and keeping it nice and rich attracts worms (who make your soil better) which in turn attracts moles. Seems like a lose/lose situation. We have sandy soil and it appears the mulch and soil improvements we've made over the years are successful. Our garden is beautiful and the moles love it! Grubs are another mole favorite. They'll dig anywhere to get a tasty grub. Grubs are actually one of the mole's favorites, next to worms of course. Many moles tunnel through grass as well so they are often mentioned when lawn maintenance is mentioned. The Latin name for moles is Scalapos or Scalapus aquaticus...I don't know about the aquaticus part but they are definitely scalpers of the landscape! However in reality it literally means 'blind rat'. You will rarely actually see a mole because they spend most of their time underground. They have tiny little eyes that are actually covered with skin and fur, maybe they are light sensitive as it is known that their eyes are poorly developed. Moles are able to dig up to fifteen (15) feet per hour! Digging is most pronounced when the soils are moist in the spring and fall. What happens to all that dirt? It gets pushed out of the tunnels to the surface with those wide front feet leaving a mound, otherwise known as the “Molehill”. It's no wonder there are mole tunnels everywhere! Fifteen feet per hour is a lot of tunnel. Do we make mountains out of molehills? I think not, finding all those tunnels with their mounded molehills is enough to drive you crazy and the size seems like a mountain when its in the middle of your flower garden. Not to mention if you step in one without knowing you can get a good sprain of the ankle as it turns down into the tunnel. Moles like wet soil; it's easier to dig and has more worms. Moles eat 70 to 100% of their weight in food every day. Moles will fight to the death to defend their territory. Moles are usually about 6 inches long. Female moles give birth to a litter of up to five. Moles are active all day and night. Baby moles search for new territory in early summer. Male moles are called boars and female moles are called sows. 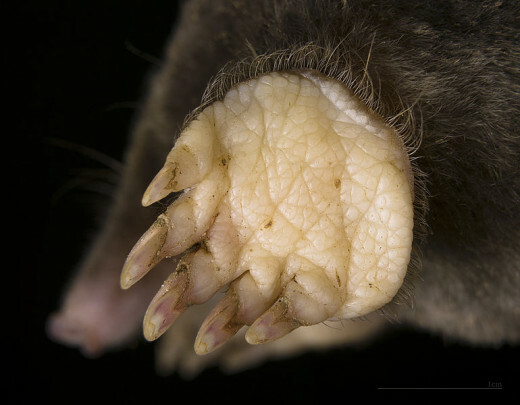 Moles have an extra thumb next to the natural thumb. The very worst thing I read about moles is that they are beneficial to the soil! They aerate it. I really don't care how beneficial they are I would really rather they live in someone else's yard. As a matter of fact according to wildlifetrusts.org, moles can be found anywhere except for the Channel Islands, the Isles of Scilly, Scottish islands, the Isle of Man and Northern Ireland. 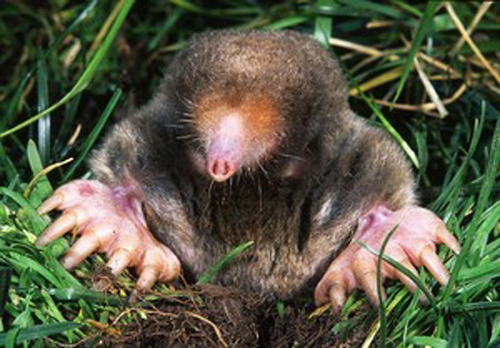 Not ironically moles are mammals related to the shrew. Ironically a shrew is described as a small, mole-like mouse. Which came first the mole or the shrew (the chicken or the egg)? I have read in several places that the soil in a molehill (or the top of the tunnel) is very beneficial soil and can be used to grow plants. Amusing factoid since I was trying to grow plants there in the first place! 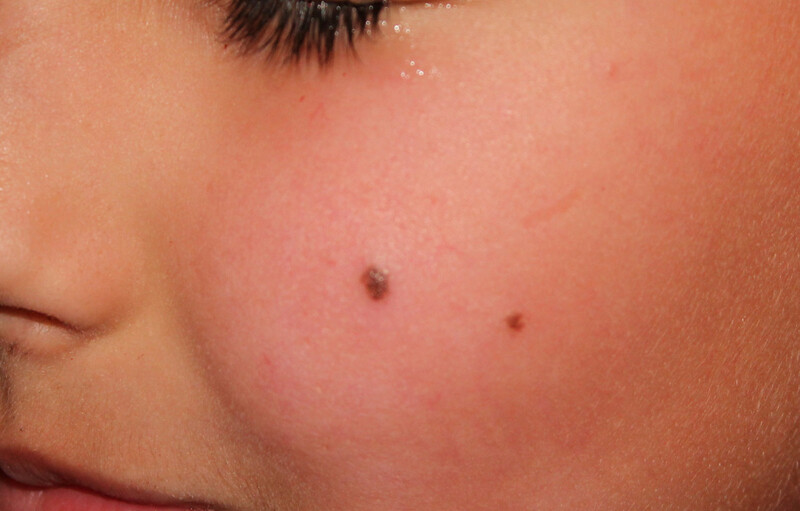 How do you get rid of moles? I wondered if there were any recipes for mole stew or mole soup but since I can't catch the darn things it wouldn't matter anyway, besides you'd need an awful lot of moles since they're so small. I did read they were once trapped for their furs, honest! If you're lucky enough to have a dog that actually catches moles, read no more. If you're like me on the other hand, and have a dog that just digs up the tunnels all over your yard, you may need some hints. There are as many products on the market to get rid of moles as there are moles. There are spikes, repellents, poisons, bait, etc. It seems the most effective is the mole trap but you have to sure to place it in an active mole tunnel. They all look active to me so I find this a little difficult to determine. Some say getting rid of grubs will get rid of moles, but what about the earthworms they eat? Do you really want to get rid of earthworms? Here's a dandy hint from ehow.com, castor oil. Yes, I said castor oil. 1. Fill a 1-gallon jug (an empty milk jug works just fine) with warmwater, leaving about 2" empty at the top. You will need the extra space for the next ingredient. 2. Add 1/4 cup of castoroil to the water in the jug. Measure this out if you need to. You want to be sure you use enough, but not so much that you gum up your yard! 3. Place the cap on the milk jug and shake it gently to combine the water and oil. 5. Repeat the process (1 gallon of water with 1/4 cup castor oil on any molehill) so each molehill receives 2 gallons of water and 1/2 cup of castor oil in total. 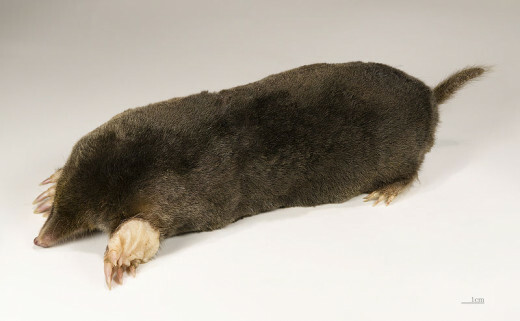 Moles hate castor oil, and will normally move away from it immediately. Try not to smile too hard if they set up camp in your neighbor's yard! I think they are serious about this. I haven't tried it yet so I really don't know if it works. The same site recommends Bounce Fabric Softener Sheets. If, and I emphasize IF either of these work it would be great because you wouldn't be using pesticides and you wouldn't be killing the mole. I've also read spearmint chewing gum stuck in a tunnel will scare them away - believe it or not I was gullible enough to try this and of course it didn't work. What method you use and what results you get can be very interesting. As a matter of fact, anyone reading this may be interested in something that really works. Please feel free to share any method you find that at least drives them away, in the Comments section below. Thanks for reading and happy mole chasing. If you've had moles in your garden what happened? I bought traps and I'm waiting to catch one. I was able to chase them away with chemicals. I have a call into Bill Murray. You mean I have to move to Canada to get rid of my moles klidstone ;) Glad you enjoyed. Yes sir, I don't see any new runners/tunnels, got my fingers crossed. That's encouraging Shyron. Thanks, I'll have to check it out. Tillsontitan, this is a great hub. I just went to Home Depot and bought Mole and Gopher repellent and it works on skunks also. Just sprinkle on the mole runners and water in. I bought a different brand a few years ago and it lasted a long time, and need to check on the one I just used. But should have worked like the other one. Thanks Brett. If I don't keep my sense of humor about these little varmints I'll scream ;) I truly appreciate all the shares and votes. Barbara, I have a min pin who eats everything so the castor oil plant is out for me. Kathleen I'll be waiting to hear how your machine works. Well Moonlake, my min pin thinks he hears or smells them...I have holes all over the yard to prove it, but he hasn't caught one yet. So I guess the chihuahua beats out the min pin when it comes to moles. I've heard of cats catching them outside too. Thanks for the vote! Of course I put they're instead of their!!!!!! What I mean is " Their hearing is better than ours." Here's what you have to do. You go to the animal shelter and you adopt a little Chihuahua. My husband had him outside yesterday and Sheldon (the dog) kept looking through the grass suddenly he jumped and had a mole in his mouth. Killed it instantly. Later that day I had both dogs outside the Doc (Springer) and Sheldon. They both jumped in the grass and the Springer came up with a mole. It's fun to see them hunt moles. They're hearing is better than ours and they must hear the moles in the grass. When the weather gets cold the moles manage to come in the house. The cats take care of the house. Spent $30 at Pike's Nursery on a Moles Don't Like This Noise machine that is solar powered and we can hardly hear. In the month we've had it, I don't see as many mole holes around my garden. 30 feet radius. We'll see how it goes. This makes a lot of sense. They say planting a castor oil plant will keep them away. The problem with the plant is that it is poisonous. The picture caught my attention! lol. This was an interesting read about a frustrating problem. I also loved you honesty, it made me laugh! "believe it or not I was gullible enough to try this" :-). Shared, pinned, tweeted, up, useful, funny and awesome. Before we fenced in our backyard Peg, we had skunks too. Funny story, when my youngest son was about 13 he was riding his bike at night and ran over a live skunk....we could smell him a mile away! Mary, do be careful what you wish for. My dogs are great hunters, unfortunately, they chase skunks which moved into my back yard and Yeeaaachh! Not fun when they spray the poor pups. We have bunnies and armadillos and a host of other varmits here, too. Hopefully, you won't send us your moles. Best of luck on moving them along. That's the truth Rebecca, I just wish my dog would get one once in a while! They keep my dogs entertained! I find this so informative. Thanks! You are most welcome Sugahware...my minpin tries to dig them out too! Thank you for this excellent hub! I've been fighting moles for years. Now, my new puppy keeps trying to dig them out and my yard is filled with holes. I am definitely going to try the caster oil. Thanks! Mary, I have to be careful because my dog eats EVERYTHING and I don't think mothballs would be good for him. Ignugent my dog digs tunnels all over trying to get the moles but I think he's digging in tunnels after the moles are gone. Arb you are, of course, right. No amount of treatment is going to do any good when they're actually living next door and only visiting :) Thanks for your experienced comment, always appreciated. Hi everybody! I have sprayed castor oil products around the entire perimeter of homes and that is after my customers tried mothballs, peanut butter, gum and a host of other myths. We even purchased a verminator which was $2800 dollars. It's a propane fuled exterminater which probably affected the hearing of the little rascals but did not eliminate them. 15 years of experience has taught us that underground bait is the only expedient and effective method. Traps work but they are labor intensive. Another thing, they are coming from somewhere. So if your neighbor isn't getting rid of theirs, they will re emerge. Treating the burrow system occasionally will manage the problem, but, they will never dissapear; They like us. Great information. We have moles also and sometimes our dog digs it tunnels. They really made the part of the yard so soft. I thought everybody knew: just put some moth balls in their tunnel. I don't know if they kill the mole or what, but you won't see them anymore! 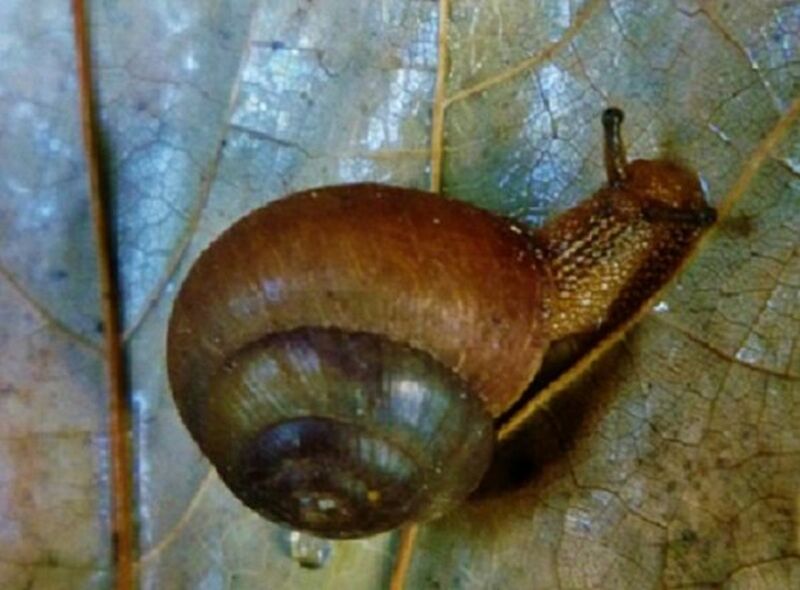 We have lots of these critters in our area. I have to tell you on further research Sharkey, the gum doesn't really work but the castor oil does! My neighbors dog caught one too teaches. I guess we can always count on nature to give us a helping hand. My son was able to rid his yard of moles through his cat. The cat found each one and kept the yard Fred of them. They are hard to chase from your yard. Hope you find a good solution. I have mole-phers. I'm sure that they combined to form and unstoppable hybrid. Great hub, and I am definitely going to try the castor oil. And maybe the gum too! Just to be safe! Vocalcoach, I'm thinking arb knows what he's talking about so I'm going to see if I can buy the stuff he recommended. Thanks for the compliment! Well, tillsontitan, I'm now dying to know after you plant the peppermint plant, if it worked for you. Also, as a vocal coach, one of my new male singers said his singing is so bad that his moles packed up and left. So if the peppermint fails, find a singer who sings off-key. Love your writing style and pushing all buttons with a vote up! Again, thank you arb. It drives me crazy that the mole hills kill my flowers! If your home depot dosen't carry it you can buy them n line. more expensive isn't better, just a reg cheap gopher poker. Wow arb, that's the best news I've had all day. You can bet your bottom dollar I'll be going to Home Depot! Thank you, thank you. tillsontitan, well written and peppered with humor. I owned a pest control company for many years, sold it to my partners, so I could not help but smile. Can't tell you the countless hours of research and experience I've dedicated to these varmits. The internet is littered with myth and tips which will end up frustrating you and making the mole laugh. Traps work, but are labor intensive. Castor oil is about 50% effective and like it or not, chemicals, if you have a serious problem, is the only effective method. 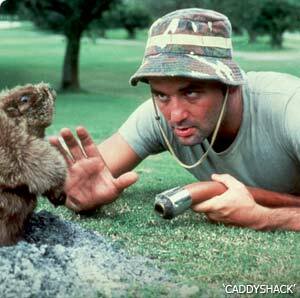 A half teaspoon of "gopher" go down a hole and by tomorrow he is drop dead gone. The real secret is to put the bait about 3 - 4 feet from the hole, in his tunnel, because he will come to close up his hole and end up throwing the bait up. They make a device called a gopher poker, which allows you to probe for the tunnel and then deposit bait there. Home depot carries them here for $20.00. I;ve probably done over a thousand yards and at a cost of $150 per call, it is worth the $20.00. The bait is about $10 and will last the average homeowner about 2 years. A lttle free inside info for your reader. So glad you enjoyed Lesley. I have a feeling they're here to stay! Have a good day. I loved your article and had to laugh in places, but moles are no laughing matter! Hope you manage to get rid of them! Barking dogs shea? My min pin is a ratter but hasn't caught a mole yet! Oh GF we are bad to the bone! Now I have to go look up Eileen Woronos. Thanks bac2basics. I know what you mean, part of me feels bad about killing any kind of animal but the other part of me wants to wring their necks bare handed! Hi. Your hub did make me laugh, but I know it´s not funny having moles in the garden because I had them in my last one in the UK. After trying to scare them away with kiddies windmills stuck into the molehills and various other tricks I bought smokes to try and get rid of them but felt so bad that I dug them back up after a couple of minutes. My garden backed onto a golf course and in the end the problem was solved by the green keepers methods of mole control. Voted you up and following. Oh my my, Mary, dear GF! Are you kidding? We must never allow these guys to get together....OMG....can you even imagine? Think of world peace if nothing else! lmao.....seriously? poor poor Jim,would be the first to admit, "Yes, my wife is a real doozy......what can I say?" Oh till...trust me, I think Jim would welcome a sweetie like you with no problem whatsoever...I mean, C'mon girl, the guy lives with ME??? Eileen Woronos would be an improvement!! (go ahead, google, if you don't know who she was) lmao! I hate to rebut your comment..but quite obviously, it took Larry 45 seconds to know you were the love of his life...no matter what!! No dount that you and Sunshine and myself could cause the poor guy to scratch his head....but we could also convince him, it's just a bit of dandruff!!! Till, there was a choice you didn't offer in your poll: barking dogs! Hi, I remember sitting down the park a couple of years ago and was surrounded by mole hills, all of a sudden I saw all the earth move at the top of a pile and a little nose pop out! lol! I was so pleased it wasn't my garden! good luck and don't forget the chewing gum! lol! Our little trio (SS, you and I) could go far though...we just have to figure out our niche. Till....I would say we should write into "Wife Swap,"...but you'd find yourself jumping from the nearest Cliff after 2 days with my precious guy....he's over-the-top hyper/OCD....the kind of guy you REALLY have to love so you don't accidentally shoot him....takes someone like me (and we won't get into that) to deal with him with ease. However...for you, it would work out great because 2 days with ME and Larry would crawl back home on his hands and knees and kiss your feet and hang on for dear life....and worship the ground you walk on!!! LMAO! Although....I'm sure he does already! You guys have been together since birth, haven't you? So... it's a strange thing that women can be so much alike...yet have very different relationships.....Yes, we are sisters in many ways. Sunshine uses the phrase, "Sister by a different Mister".....LOL! Okay Effer so now I have things in common with Jim? We really need to hook up someday, I think we are sisters from a different mother ;) Moles are the bane to all who garden or care about their lawn. THAT is such an UGLY creature YUK!!! No wonder I can't kill the grubs Golfgal. Never realized there was a window to kill grubs. Some years we seem successful, others not. Guess we accidentally caught the window. These are definitely moles, one or two have been spotted or killed. I don't think we have voles in our area. hey tilsontitan, I had to smile thinking you were out there stuffing wrigleys down the track holes in your yard. The unwrapped gum is eaten by the little varments and it gets stuck in the intestinal track and they die. That is the theory there. As for earthworms, the moles will eat them but they are more interested in the grubs that just stay in one place and wait to be dinner. Spreadable Grub killer is effective, but only when the grubs are close to the surface of the grass. This happens twice a year. First when the grubs rise after winter slumbering to feed on the roots of your grass, secondly after the adult beetles have laid eggs that hatch and begin to feed on your grass roots before going down deep into the ground for the winter months. So you have two windows of opportunity to kill those little critters. Go to the nearest garden center or call the local extension service to learn about the japanese beetle life cycle in your area. If you are in Maryland for instance, it would be May and late September. Assuming you have moles and not voles. Voles feed on the roots of trees, shrubs, plants and grass. So if you are finding holes in your garden and dead plants....sorry you may have voles too. This is great and amsuing writing about a subject that devils gardeners everywhere. Knocking on wood, I have not seen any evidence in our gardens, not sure if there are moles or gophers around here, but I see their hills around in parks. A couple of questions occurred: 1. Was that Wrigley's Spearmint? Did they mean chewed or unchewed? If it stuck to their claws the way it does to shoes, they would leave in a huff. 2. You mentioned they have been trapped for their fur. Would that be maybe the "moleskin" clothing I see advertised? (Just kidding, I hasten to add or someone will think I am seriously stupid). Keep us posted on this saga please! Up! Okay Bob, it's early in the morning here and you're making me look stuff up! You are too much..a mole pet. If moles honor you with their presence you are stuck with them until they move on. Eradication costs more than it's worth and will damage your garden worse than the moles did. When the lumbricus terrestris population drops, moley will move next door. (Google it). Moles have never been kept in captivity. Fact. But why would you bother? You'd need to go underground to ever see them. I think that the moles are finally gone around here. We used to have them pretty bad, so I guess sending them to the neighbor's yard worked out.